China’s e-commerce market is expected to leapfrog that of the United States this year to become the world’s largest by total customer spending, management consultancy firm Bain & Company says, and could account for half of all Chinese retail spending within a decade. The change in shopping habits comes as almost half of the country’s 1.3 billion population now have direct access to the Internet, and of that number nearly 80 percent own smart phones or tablets. China’s e-commerce market has grown at an average rate of 71 percent from 2009 to 2012, versus 13 percent in America, and its total size is expected to reach 3.3 trillion yuan ($539.07 billion) by 2015, Bain & Company said in a report released on Wednesday. Total spending by Chinese consumers on online shopping reached $212.4 billion in 2012, compared to $228.7 billion in the U.S., the report said. Chinese companies with retail outlets have had to realign their sales strategies to compete with online rivals who threaten to undercut them in an increasingly competitive market long dominated by e-commerce company Alibaba Group, and others like 360Buy Jingdong. “It’s a massive change. It just means you need to be on the web, whether you like it or not,” said Serge Hoffmann, a partner at Bain and co-author of the report. While still a small portion of total revenues, the growth of online sales is far outpacing offline sales growth. Haier Electronics Group, which operates an online stall on Alibaba’s business-to-consumer site Tmall.com, saw its e-commerce revenue jump almost 500 percent to 633 million yuan, or 2 percent of its total revenue, in the first half of 2013, from 106 million yuan in the same period last year. Its total revenue grew 10.2 percent. 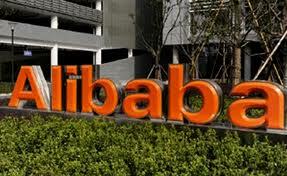 Suning Commerce Group saw its e-commerce business rise to 10.6 billion yuan in the first half of 2013, an increase of 101 percent on the same period last year. Soon retail companies may have to take a leap of faith, shutting their bricks and mortar outlets to reduce overhead costs and hope that customers will turn to their online stores, said Nicholas Studholme-Wilson, a senior analyst at Sun Hung Kai Financial in Hong Kong. Alibaba, whose Taobao customer-to-customer website is the world’s 10th most visited according to web monitor Alexa, predicts e-commerce will account for half of all Chinese retail spending in 10 years, from 6 percent now. “Proliferation of smart devices mean everybody is connected at all times, that’s one of the key drivers for this,” said Studholme-Wilson. “Another problem you’ve got in China is that retail is so damn expensive. Land costs and labor costs are all really hurting margins. Whereas it’s actually very easy to set up a shop on Tmall and your costs are massively reduced,” he said. Logistics, however, pose a major obstacle to e-commerce development, and Alibaba is now working with Chinese logistics firms to improve nationwide infrastructure and delivery networks, said Shih. Gome Electrical Appliances, whose online revenue now accounts for 5-6 percent of its total earnings of 27 billion yuan, is changing its retail strategy to accommodate the new wave of online customers. The firm closed a total of 35 stores in the first half of this year, said Helen Song, a spokeswoman for Gome. Now the company plans to continue moving away from its physical business to better supply China’s rapidly changing consumer habits.